To experience the London cycling revolution, there is nothing better than taking the British Capital by bike yourself. If you do so by cycling from east to west, using our London-Land’s End Cycle Route Book, you are up for a very special cycling adventure. This article shows you how you can cycle across London in three days the Dutch way, without having to fear for serious motorised traffic! London Bridge station is a natural start- and end-point for this journey, as On Your Bike (next to the station) provides the only high-quality bike rental in the city, with a good stock of hybrid bikes, suitable for multiple day-touring. Also, if you decide to bring your own bike by train, London Bridge is the ultimate hub, as it is London’s only large terminal which allows you to bring your bike by train from all directions. We start our journey just after lunch time, a good moment of the day to board a train with bikes to nearby Woolwich Arsenal station. Making our way from this station to Woolwich’s riverside, we can immediately see how much London has changed the last decade. Dual carriageways with manic traffic used to rule the Woolwich station area totally, but the new “shared space” piazza allows us to cycle happily among skaters, pedestrians, street parlours and many other cyclists, without the continuous noise of motorised traffic. It is a good example of how the “Go Dutch” Campaign starts to spread in the British capital and we hope to see more of this in the years to come! From Woolwich, we cycle on the splendid Thames Cycle Route. London’s famous river is tidal here, meaning we can smell the silt of the sea and can catch a refreshing breeze, despite being surrounded by the extensive urban wilderness. We look out over the Thames Barrier before we sit down at the Anchor and Hope, one of the few pubs on this route with outdoor-seating next to the river. Looking eastbound to the City, we can see a dramatic skyline, with high clouds gathering over the O2 Arena (Millenium Dome) and the Canary Wharf business area. We make our way to Greenwich. The viewpoint in Greenwich Park next to the Observatory is located exactly on the famous NIL meridian and provides spectacular views down to the river with the National Maritime Museum and the high buildings of Canary Wharf on either side of the river. Heading down back into the valley we also take in the views over the famous ship Cutty Sark before we make our way further west. Rotherhithe has many converted warehouses and its modern YHA is directly on our route, making a perfect budget overnight stay for cyclists. Just next-door, a large pub has good riverside outdoor-seating, allowing us to dine whilst watching the sunset over the city, not to mention its amazing lights once darkness has kicked in. Our second day takes us within ten minutes of cycling under the Tower Bridge and of course we stop to take some pictures of this famous London landmark. We now join the Southbank cycle route. If you wanted to visit all its attractions, you could easily spend a day here. We are on a bike ride though, so we just enjoy the sightseeing from two wheels; we cycle by Shakespeare’s Globe Theatre and Tate Modern. Then, it suddenly hits us, as a revelation! London Eye is not just what is seems, it is in fact the largest bike wheel in the world! We admire its shape; how the spokes make their way from the rim of the wheel inside to the axle. It is indeed the perfect copy of a bicycle wheel. Might it have been the London Eye that really started London’s rediscovery of the bicycle? 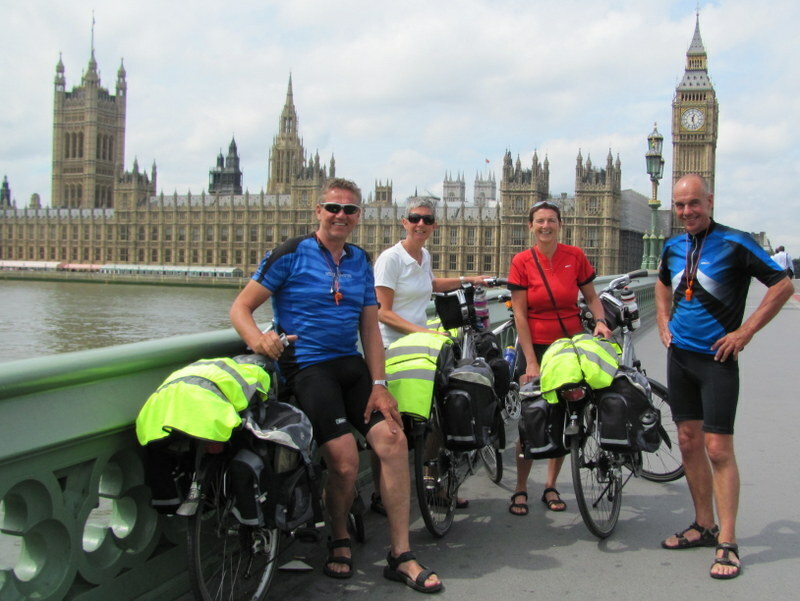 We are still overwhelmed by this thought when we run into a group of Dutch cyclists on Westminster Bridge using the Dutch version of our traffic-calmed guide book. After admiring the Big Ben, the book suggests to walk around Parliament Square, but taking in the scene, observing how many local cyclists dare to mix with cars, buses and taxis these days, we decide this must not be hard to do. Indeed by “taking the lane” and just being part of the slow moving flow, we find it is not too bad to cycle on one of London’s busiest squares, so long we keep watching everyone's movements around us. We rush to Buckingham Palace from where we resume our “easy pedalling” mode. The adrenalin has worn off, so we fully enjoy a great traffic-free cycle path which takes us under Wellington Arch into Hyde Park. Just as many other cyclists on their Santander Bikes we enjoy the easy pace of cycling in Central London’s biggest park. As it is about lunch time now, a picnic in the park is the obvious thing to do! After lunch, we head into the quiet backstreets of expensive South Kensington. On our bicycles, we just feel as luxurious as the many expensive cars parked on the road sides here. We make our way to Putney Bridge from where we cross the River Thames back to its southern bank. Suddenly, the city seems to end and we find ourselves on green alleys, surrounded by sports fields and parks. Here and there, we cycle on another quiet residential back street with big villas, making our way to Richmond Park. Richmond Park is amazing. Because of its sheer size, it hardly feels like a park. We feel like cycling in a National Park, especially when we have to wait for a herd of deer crossing our leafy lane. Cyclists from both directions patiently wait for the herd to cross and there is no car in sight. The horizon consists of moors and forests. How is it possible we are still surrounded by the houses of Greater London? If we didn’t know better, we would never believe it! It is by 5 pm when we reach Kingston upon Thames, a town with a clearly independent feel, despite its Greater London location. We check in at a local B&B and dine at one of the many riverside restaurants. The end of a perfect urban cycling day! The last day of our three-day cross-London cycling adventure takes us on the River Thames towpath. London’s famous river has truly transformed since we started our adventure in Woolwich. It is just a pleasant stream now, popular with boaters, anglers, walkers and cyclists. The pace of life is slow, relaxed, like the swans hanging out on the water. Because of the many trees on both sides of the river, it is hard to notice the surrounding London suburbs at all. The only proof of the fact we are still in a major city, are the regularly overflying planes heading in and out of Heathrow Airport. Slowly, we make our way past small towns on the riverbank, first Hampton with its grandeur Hampton Court Castle, followed by Walton, Chertsey and Staines. The Runnymede locks mark the end of our journey alongside the river. We climb the ridge out of the Thames Valley, a long steep climb which makes some of us walk and others feel like they are climbing a Tour de France mountain. It takes us into an entire different world; the large sway of woodlands of Windsor Park. The guidebook route takes us to a splendid viewpoint at a statue of Queen Elizabeth II, overlooking the Long Walk, a long grass promenade with Windsor Castle on the horizon. Lunch time is slightly overdue, but this majestic picnic site made it worth to wait! After lunch, we had into scenic Windsor Town and cycle the river bridge to Eton, with its great views up towards Windsor Castle. Over the bridge, we are once more exposed to the idyllic Thames river scene, but the end of our three-day ride is looming. We cycle next to the 2012 Olympics rowing lake and then head for Bray, a picturesque village on the outskirts of Maidenhead, our final destination. Once we arrive at its station on the main line between London and Bristol by 4pm, we truly feel like we have conquered Britain’s capital. We head back to our homes, treasuring great memories of a great cycling adventure! Also watch our London Cycling clip on YouTube! 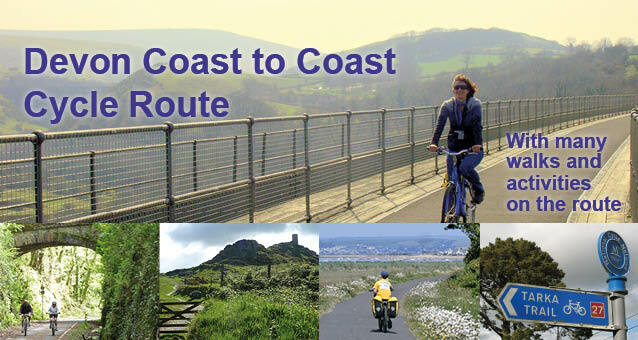 Sections of the route as described above are signposted through Sustran’s National Cycle Network, but it is only the London-Land’s End Cycle Route Book which connects it all together to one enjoyable continuous traffic-calmed route, allowing you to take in all the famous landmarks. The book features full route directions, maps, cyclists-focused visitor information and listings of conveniently located accommodations, (bike) shops and pubs. Additional traffic-calmed cycle routes allow you to bring rented bikes back from London Paddington Station to the London Bridge bike rental. These connecting routes link all major London railway stations! 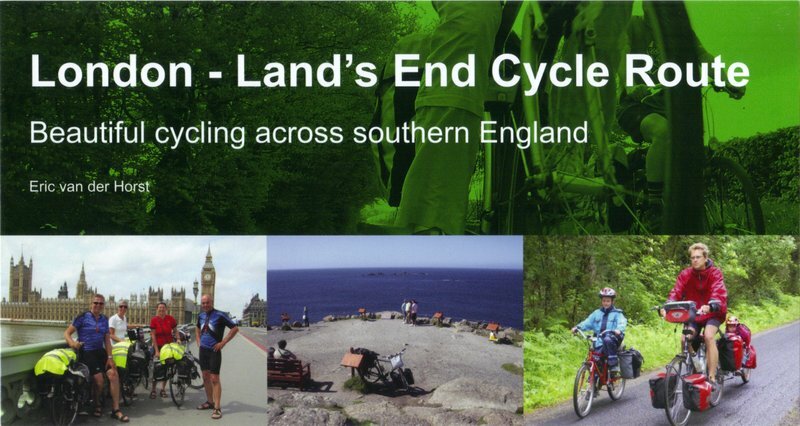 This guidebook is not just about London; the book of 164 pages in convenient handlebars-pocket size provides the same level of local knowledge for another 880 miles of cycle routes in southern England, allowing you to cycle Dutch-style from either Dover or Harwich all the way to either Land’s End or Plymouth! If you order your copy via the designated website you also receive GPS-tracks of all routes, which you can upload to your Outdoors App or navigation device. Further note by the author: This blog article doesn't want to suggest in any way that it is now easy to cycle London "The Dutch way". The research for the route as described above has taken years. As you'll discover for yourself, the route is only manageable by taking many non-obvious turns and following quirky passages to stay away from main traffic corridors, not to mention dodgy path surface on some short stretches. 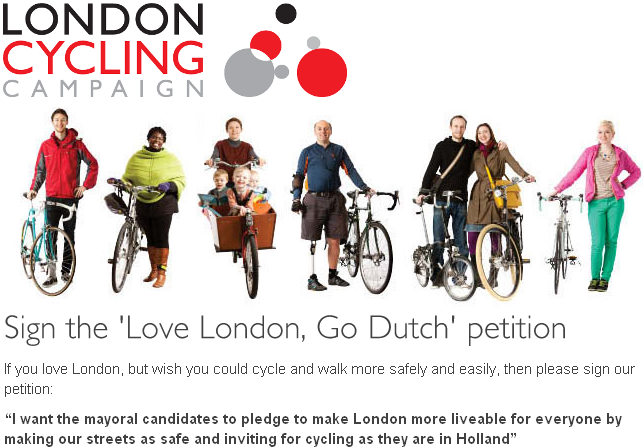 London has a long way to go before it can indeed present itself to the world as a cycling-friendly city Dutch or Danish style! 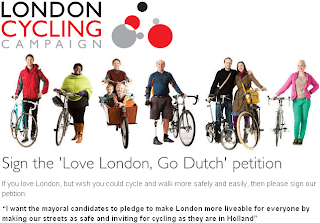 Please pledge your support to organisations as the London Cycling Campaign, the Times Cities Fit for Cycling campaign and the Cycling Embassy of Great Britain to force politicians and highway authorities to change their ways and make it happen! Fancying a truly Dutch ride? 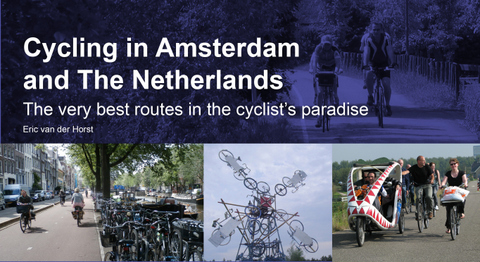 What about my guidebook Cycling in Amsterdam and The Netherlands - The very best routes in the cyclist's paradise. It makes you travel beyond Dutch cliches like clogs, windmills and the Amsterdam red light district, allowing you to truly explore the lowlands. The book features 1064 kms of routes and has special chapters explaining the unique Dutch cycling-minded traffic rules and its cycle route signage systems; 164 pages, colour, wiro bound, fits in standard handlebar bag.